The SixPack Rack adaptor is triple hit! It may be used to mount the SixPack 500 series power rack into a standard 19″ rack or be mounted into a desktop. 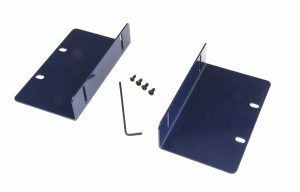 In this case, a series of mounting holes on the SixPack work in conjunction with the angle brackets to enable both flush and angle mounting options. This optimizes functionality in the studio or enables the SixPack to travel on the road for live touring or provide safe passage when going between studios.